You’d be hard-pressed to find an American cannabis consumer who doesn’t recognize the name Tommy Chong. 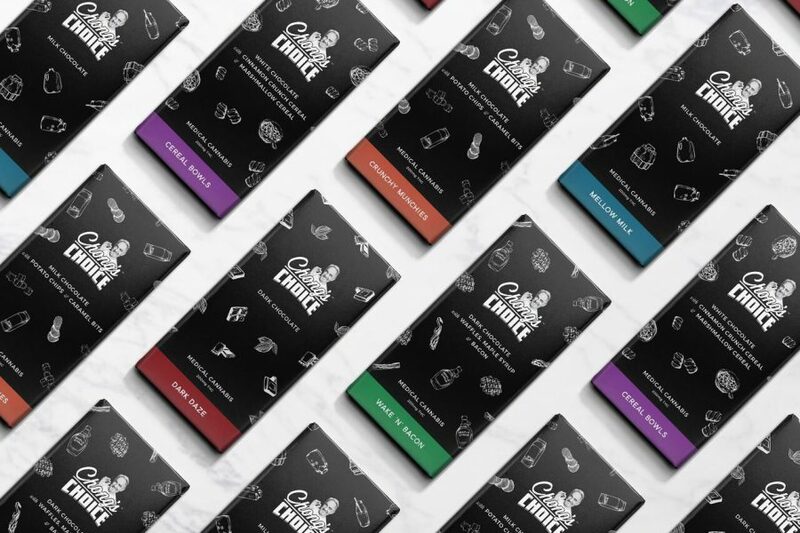 Now with his brand, Chong’s Choice, the cannabis icon curates some of the finest marijuana for you. Every strain offered and used in his products is handpicked by Tommy himself. Always expect locally sourced, organically farmed, and lab-certified cannabis grown with one goal: to get you very high. If you can’t trust America’s cannabis sweetheart about cannabis, who can you trust? Their sweet Wake ‘N’ Bacon Dark Chocolate Bar immediately caught my eye. I was instantly wowed by the distinct flavor combo, texture, and quality. How often do you see chocolate with waffle chunks, bacon and maple syrup, much less a cannabis-infused one? The flavor profile alone makes the edible worthwhile, especially since everything is better with bacon. In this comprehensive breakdown, we’ll determine if Chong’s chocolate matches the man’s reputation. Your experience begins the moment you get the child-proof, matte black packaging, adorned with sketched art to match the breakfast theme–a hand-drawn waffle here, a piece of bacon over there – along with a picture of the man himself. The package says the infused chocolate bar contains 100mg of THC, but the lab sticker right below states it actually has 90.5mg (fluctuations are now common with mandatory testing). On the back of the bag are directions for opening and usage, dietary facts, a list of ingredients, company information, MFG date, best by date, lot number, license number and government warnings. There’s also a little note about the company and the chocolate bar’s flavor. I would like to have seen some information on the strain(s) and type of extract used. A QR code or some way to verify lab test results would also be helpful. As you reach the box and start unwrapping the gold foil, you’ll notice the heavier-than-usual weight and density. Once unwrapped, the edible looks crafted by a Parisian chocolatier. The back of the bar looks unrefined and textured with protruding chunks, adding a nice visual contrast. Your curiosity is officially piqued. It’s separated into 20 demarcated pieces of 4.5mg each, a nice option if you’re new to cannabis or prefer a lower amount. I was pleasantly surprised by the perfectly crunchy waffle pieces embedded within the dark chocolate. Sweet, salty, savory and bitter all in one bite. Then I appreciate the subtle hints of rich maple syrup and smoked bacon that pair so well with no artificial additives. From a flavor perspective, this one will expand what you thought possible for a cannabis edible. When it comes to flavor, ingredients and quality, Chong’s Choice Wake ‘N’ Bacon Dark Chocolate Bar gets the top grade! Now if you need smaller doses or don’t like your chocolate with unlikely fillers, the Wake ‘N’ Bacon bar probably isn’t the best option. The pieces are very dense and might require a knife to break down the added chunks inside, making for a mess. Make sure you note the actual lab-tested THC content when deciding how much you should eat, because it may be different from the other labels on the package. Also, for someone like me who wants to consume the full dose of THC, the chocolate bar is large and rich, making it a challenge to eat the whole thing in one sitting. While the taste is unique, how’s the high? As suggested, in small doses this bar can be used for waking and baking, producing a clear high that takes about 30 minutes to set in and will keep you feeling good for hours. For a regular cannabis consumer, 3-4 pieces (13.5-18 milligrams) should be enough to make you relaxed with enough motivation and focus to get through the day. For newbies, start with 1-2 pieces (4.5-9 milligrams). Because the chocolate is so rich, it took nearly two hours to finish this big ol’ bar. The effects came on slowly and eased me into a heavy but clear-headed high. I was able to get some work done, but I also took some time to be hypnotized by a bizarre Norwegian knitting competition on Netflix. It’s not something I’d usually watch, but because of my Chong’s Choice state of mind, I couldn’t look away. The visuals of the yarn spinning wheel, the auditory sensations of a sheep being sheared, and the soft-spoken Norwegian play-by-play were enough to keep me in a trance. So you have that to look forward to. While this high-end cannabis chocolate bar contains a less-than-average amount of THC, it’s worth the around $22 price considering the unique and filling combo of bacon and waffle. Packaged in a sealed, gold-foil wrapper within a fun but classy and understated box. The box is matte black with glossy graphics of bacon, waffles, and maple syrup. Green band at the bottom makes the flavor variety stand out from the other options. Sealed in a black, child-resistant zip-bag. Graphics mirrored in a sticker, keeping this product well protected and tamper-resistant. Enough labeling for adult-use compliance, but not much more. Includes brand name, flavor name and flavor profile, net weight, batch number. Statements of passing lab tests, serving size and amount of servings, amount of THC per serving, total THC and CBD contents. Lab-test sticker shows contradicting cannabinoid contents and labels it at 90.5mg THC (4.5mg THC per serving). I’d like to have seen some info about the strains and extraction method and a way to verify the test results. Bar is scored to make 20 individual pieces, but the chocolate is thick so breaking it into exact pieces is tough (pro tip: use a hot knife). Chocolate is rich, so eating the entire dose of THC is a challenging feat–unless you have a stomach of steel. The large box clearly says “Cannabis Infused,” so this isn’t something you can munch on during a PTA meeting. If you keep the edible in its gold foil, it can easily pass for a large, artisanal chocolate bar. Made from high-quality dark chocolate; a delicious combination of chocolate, waffle pieces, and maple and bacon flavor with zero cannabis taste. Sweet, salty, savory, and bitter all in one bite. Edible is incredibly rich, so don’t plan on taking more than a few bites at a time. Texture is what you’d expect from a dark chocolate bar with crunchy waffle pieces. Left zero residue on my hands. Effects came on slowly and eased me into a heavy but clear-headed high. Got some work done, but I also fell into a delightful trance-like state while watching Netflix. Specific flavor combination makes it tricky to melt this chocolate down and add it to many recipes. Pieces might work well on top of cupcakes, ice cream–or making s’mores around a campfire. Chong’s Choice uses top-of-the-line chocolate by Défoncé Chocolatier. Since the actual THC content is inconsistent with the label and testing results, you may get a little less or more THC than you thought. For $22, this is on the high end of the market. Features a flavor combination you won’t find anywhere else, justifying the price. If you’re looking for something that’s fast and easy to consume with a high THC content, you’d be better off with Punch Edibles Punch-bar. The contrasting salty, sweet, bitter and savory taste produce a distinct experience unlike most THC chocolate bars. If you’re a veteran edible consumer or a medical cannabis patient, you’d be more inclined to eat half or the full 90.5mg bar. And while you may not be as productive with the full dose, you can still partake in creative activities or even make it through that documentary you’ve been meaning to watch. Just remember: this Wake ‘N’ Bacon bar is filling so make sure you have room; and, despite the pre-divided pieces, it’s difficult to accurately dose since it’s so thick and chunky. If you’re looking for a quality, distinctly flavored cannabis chocolate and only need a small dose, this is for you. We dig it, man. If you live in the Los Angeles area and your mouth is watering for cannabis-infused chocolate with waffle chunks, bacon and maple syrup, click here to see if your address is available for Nugg Club delivery!